Back in the early Jurassic Era, 190 million years ago, enormous dragonflies of the anisopteran family Petaluridae lived in swamps and bogs on the ancient continents Laurasia and Gondwana. Their fossil remains, readily recognisable by a unique wing venation, have been found at sites in Europe and the former USSR. The dinosaurs came and went, mammals radiated, birds discovered flight and plants invented flowers. On swamps and bogs across the newly-formed continents of America, Eurasia and Australasia the Petaluridae lived on. Today the family is much reduced in range but essentially unchanged in form and habit from those early times. Nine widely scattered species survive: four in Australia, one in New Zealand, one in Chile, two in North America and one in Japan. Of the Australian species two live in the rainforests of north Queensland and one inhabits boggy seepages near Perth. But the best-known species in the whole family, the type species, Petalura gigantea, is found in NSW. With a wing-span of just under 140 mm, a body as thick as a finger, and heavier than a fairy wren this brown and yellow giant is one of our rarest dragonflies. All nine surviving species are threatened by human activities. P. gigantea was recorded last century from marshes at Sydney and Cronulla but these are gone. Today it is found on isolated swamps in the eastern part of the State. Records plus a few unconfirmed sightings suggest it survives in the Royal National Park, in the Blue Mountains, on the Nightcap Range in the far north of the State and on Fraser Island off the Queensland coast. However, the largest and probably the most viable population is at the Wingecarribee Swamp near Moss Vale. There it lives on untouched marsh adjacent to a peat mine. It does not occur on open water or over the mine itself. 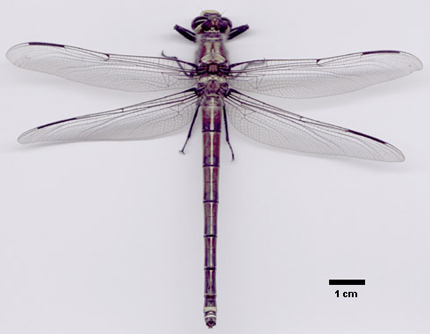 P. gigantea is a very unusual dragonfly, even apart from its great size. Two features explain its vulnerability. First, surprisingly, the adults are rather poor flyers and hopelessly bad at dispersing. Emergence takes place in late October and the flight season runs until January, but adults are never found far from their emergence site. By night they roost in trees at the swamp edge. By day they settle on the swamp itself where they perch on top of low vegetation or hang vertically from a branch. Occasionally one will fly up and grab an insect to eat. Occasionally a male will patrol across the swamp or a female will lumber in from the surrounding area and with her short, curved ovipositor insert eggs one-by-one deep into the mat of sphagnum and roots which covers the swamp. Sometimes a mating pair flies together in the tandem hold; the male in front, gripping the female by the back of her head and cloaking her prothorax with the peculiar petal-like claspers at the tip of his abdomen. But on the whole its a quiet life as an adult petalurid. Within 10-20 km of Wingecarribee Swamp are several boggy seepages and apparently suitable sites, but P. gigantea seems incapable of finding them. Second, the larvae are very slow growing, very long lived and, for a dragonfly, have very peculiar habits. Most dragonfly larvae are fully aquatic but those of Petaluridae are semi-terrestrial. At night and in wet weather they roam the surface of the swamp in search of insects and other arthropods to eat. The rest of the time they retire to a permanent burrow, a long chambered passage with its opening above water level but extending deep into the swamp. Each year the burrow is made longer. The larval stage in P. gigantea is known to last at least 10 years but estimates based on burrow lengthening make a time-span of 20-30 years quite likely. Most probably the time-span varies by several years, even within a cohort. It is the combination of poor dispersal ability, long larval life and an absolute need for permanent swamp with a stable water-table which makes P. gigantea so susceptible to human interference. Draining, mining, flooding or infill simply destroy the larvae in their burrows leaving no adult population to recolonise the swamp. One excellent way to ensure that the 190 million year history does not stop right now would be to preserve all known habitat - it wouldn't take much effort, there isn't much to save. A State-wide search for unknown populations would be very useful in order to better assess the situation. Another very worthwhile activity, though potentially long term, would be further study of the larval stages to identify habitat requirements and better estimate the time from egg to adult. As with so many of our native invertebrate animals there is much we do not know about this unique dragonfly. We need to start finding out before it is too late. John Trueman is a Lecturer, in the Division of Botany and Zoology, Australian National University, Canberra. Photo by John Trueman, The "Giant Dragonfly", http://www.anu.edu.au/BoZo/trueman/labsite/petalura.htm, 2000 (More photos and info available at this site). John Trueman, Petalura gigantea, National Parks Journal, August 1997, http://www.speednet.com.au/~abarca/npj9708/npj9708b.htm.